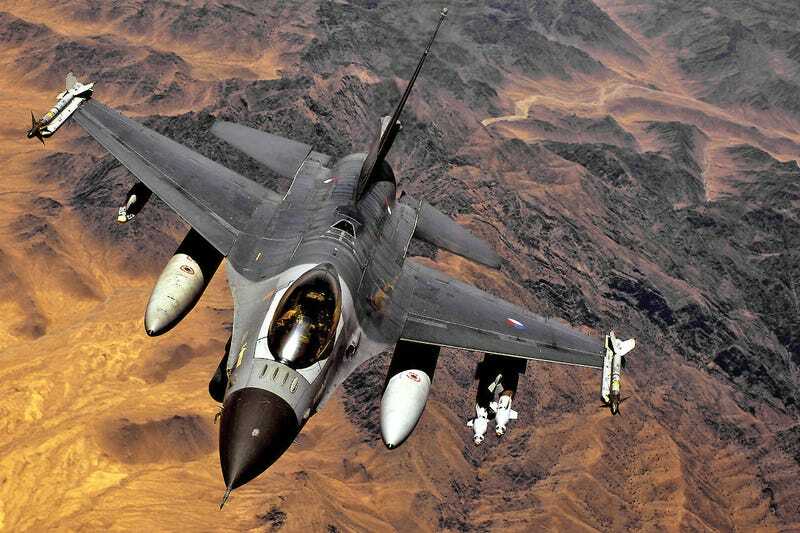 After a Jordanian F-16 pilot was captured and burned alive in a steel cage, Dutch F-16 crews are being armed with Brugger & Thomet MP9 sub-machine guns. The idea being: if a pilot ejects, they can hold off the enemy long enough for a combat search and rescue unit to arrive. More firepower gives them a fighting chance. The super-compact MP9 is available in 9mm or the saboted 6.5X25mm cartridge, which slices through body armor with ease. The weapon features a collapsible stock and fore-grip, as well as rails for mounting optics, lights and lasers. It takes 30 round magazines and has select fire for fully automatic or semiautomatic. When shouldered, it’s extremely accurate and if chambered in the 6.5X25mm cartridge, it features similar ballistic trajectories as the 5.56 NATO, allowing a the user to keep the enemy at bay over medium range distances. A single pilot is not going to take on a whole formation of ISIS fighters, but they could easily take on a small group or two when they combine a weapon like the MP9’s capabilities with their search, evasion, resistance and escape training. Generally speaking, CSAR assets are about 30 minutes to one hour away from coalition pilots operating over enemy territory. During large assaults into Syrian air space for instance, usually helicopters and their accompanying CSAR “package” will loiter over less hostile territory while the mission is underway. The V-22 Osprey, in particular, has greatly enhanced the flexibility and response times of CSAR elements operating out of Iraq. Currently, American pilots are still only armed with the Beretta M9 9mm pistol, which is not that much smaller than a state-of-the-art personal defense sub-machine gun like the MP9, but offers far less precision and volume of fire. The DoD may be wise to follow the RNAF’s lead and give our pilots a little more capability to defend themselves should a disaster in the air occur. The sad reality is that being captured by ISIS means a much more horrific death than going down guns blazing. With that in mind, giving our air warriors every advantage that could gain them even small amounts of time before CSAR help arrives makes more sense than not, and dying in a gunfight is still better than being burned alive in a cage for a propaganda video.